Jent Motorsports publicly blasts Cory Howard; Howard denies money owed: Jent Motorsports has publicly insulted Cory Howard's driving abilities in a social media post after Howard wrecked at the Illinois State Fairgrounds last weekend. The team also accuses Howard of not paying the promised amount of money to drive in the event. Jent: The Jent organization has posted that it "was promised money but got the screw" from Cory Howard. Jent explained further that "you have some drivers that flat out lie and say they have funding and they don't. This team has been put in that position twice. It is called theft by deception." Dustin Knowles NOT racing at Springfield; Cory Howard in No. 14 UPDATE: Jent Motorsports driver Dustin Knowles has posted on Facebook that he will not be behind the wheel of the No. 14 Chevrolet at the Illinois State Fairgrounds as originally planned. Knowles was scheduled to return to the series after missing the last race at Berlin due to personal commitments. Mathew Vainner not racing at Berlin; leaves Peterson after disagreement: Michigan native Mathew Vainner will not race in his home state this weekend after separating from Peterson Motorsports following Toledo Speedway in May. Vainner had planned to race for the Wayne Peterson owned team at Lucas Oil and Berlin, but the deal quickly collapsed after a major financial disagreement. Both sides have varying takes on what transpired. 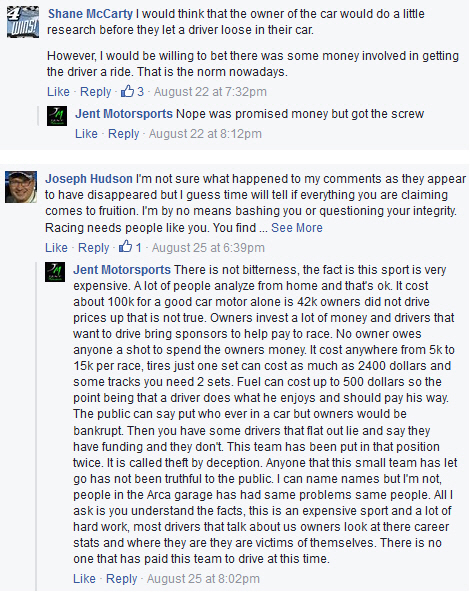 Vainner: Mathew Vainner alleges that he gave $300 to Peterson Motorsports before the Toledo race. Vainner also told the team that he had a $500 sponsor, under the condition that he would run at least half of the event. The 22 year-old driver only completed 19 laps before Wayne Peterson called him in to park. Peterson allegedly insisted on being paid the full amount and took Vainner's HANS device as ransom after Vainner left it in Peterson's truck.